Nothing will make your house smell quite as delicious as this amazing roast chicken recipe. The chicken comes out juicy, the skin crisp. It’s really one of my favorite things to make. And it doesn’t hurt that it’s super easy, too. The best part is that this is a meal that keeps on giving. For our little family we are able to really get a lot of bang for our buck. We’ll enjoy some roast chicken with garlic mashed potatoes and a side or two of veggies the day of, but we’ll also have plenty of meat left over that I can use in soups, fajitas, stir fry, or wherever. I simply shred and freeze the leftover meat. And then, of course, I can use the frame and organs of the chicken to make nourishing chicken stock. With my crock-pot chicken broth recipe, I’m usually able to stock up my freezer with enough stock to last until we’re ready for another roast chicken. Perfect. 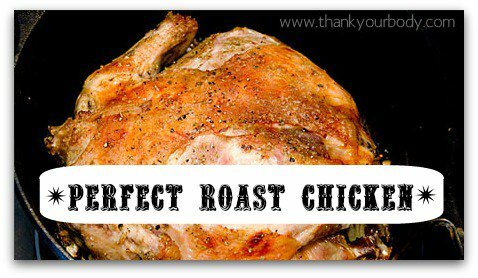 Roasting a chicken doesn't have to be scary or complicated... try it out yourself with this simple roast chicken. Spread onions across the bottom of a roasting pan or dutch oven. Generously salt and pepper the cavity of the bird (make sure to take out any giblets first). Stuff cavity with garlic cloves, 2 Tbs of butter, and both halves of the lemon. Place bird upside down on top of onions in pan. Brush outside of bird with 3 Tbs of melted butter. Sprinkle oregano, thyme, salt, and pepper over the outside of the bird. Bake in 375 degree oven, uncovered, for 1 hour. After baking, let bird rest for 10 - 15 minutes before moving to a cutting board to carve. Recipe: Best Banana Bread - A healthy take on this classic treat.